When you enter items into the online cart, there is a section where you can enter your shipping zip code. This will display all of your shipping options, along with the estimated delivery date and the cost. You can also view shipping options on the checkout page after entering your shipping address. Orders shipping via Standard or USPS options must be placed by 10am ET to ship the same day, while orders shipping FedEx must be placed by 4pm ET. FedEx Ground: SEE MAP BELOW. For guaranteed delivery in 1-5 business days, depending on your zip code. We ship from NY, on map, "dark pink" areas around NY should arrive in 1 delivery day, "light blue" areas should arrive in 2 delivery days, etc. Please be advised that weather related delays are not covered under the FedEx guarantee. 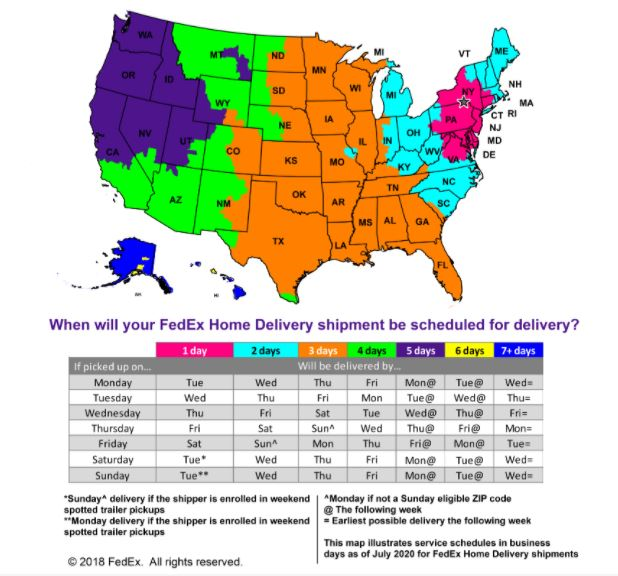 The map above indicates FedEx Ground Transit Time for shipments sent from Petal Garden in New York. FedEx Ground Residential delivers Tuesday through Saturday. For all other FedEx methods, only business days are counted as transit days; weekends and major holidays are not transit days. Weather delays may impact delivery schedule and are not covered under the FedEx guarantee. Rush orders received by 5pm Eastern time on weekdays generally ship the same day. Our Standard Shipping option generally ships via the US Postal Service, which is typically delivered in 3-7 business days, but not guaranteed, so we recommend selecting a FedEx method if you need your order by a specific day. Also, Standard Shipping is available for Continental US deliveries only. Please do not choose Standard Shipping for HI, AK, or International addresses as it will delay your shipment while we try to contact you.